Key West is at the most southern point of the U.S.A. The best way to get there is by a hired car from Miami or to take the shuttle bus from Miami International Airport. The scenic trip across the US 1 to Key West takes roughly three hours and offers the best impression of the island. For those who are not able to wait - take a direct flight from Miami. In Key West you will find a very open minded crowd. Gays are so integrated in the community that they are almost not noticeable in every day life. Duval Street, known as the "longest street of the world" connecting the Atlantic with the Gulf of Mexico, is the main shopping district. But watch out for the shops bearing the rainbow flag, many of these are tourist traps. The "Fantasy Fest" takes place every year in October, which is the largest attraction of Key West. At this time of year this small island seems to almost burst with gays and lesbians gathering here from all corners of the globe. After indulging in a sight seeing trip, including the Ernest Hemingway Home, one of the best things to do is to relax by the pool at your guest house. The early evening starts with a cocktail (normally complimentary in all good guest houses). Most action takes place in the early hours of the morning in the hot tub! 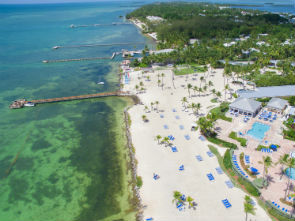 The best time to travel to Key West is in the winter when there are still tropical temperatures.